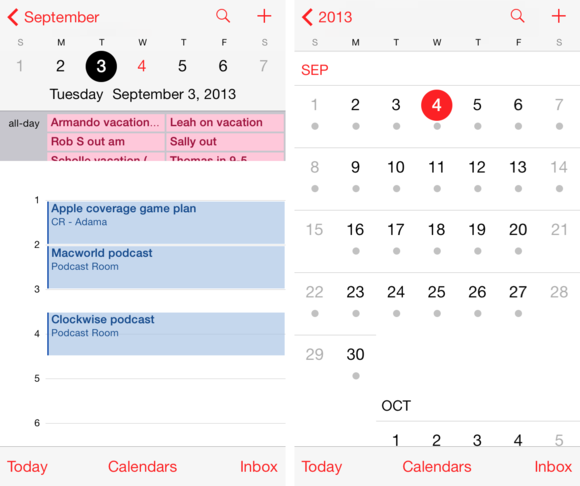 Meet the new calendar in iOS 7. 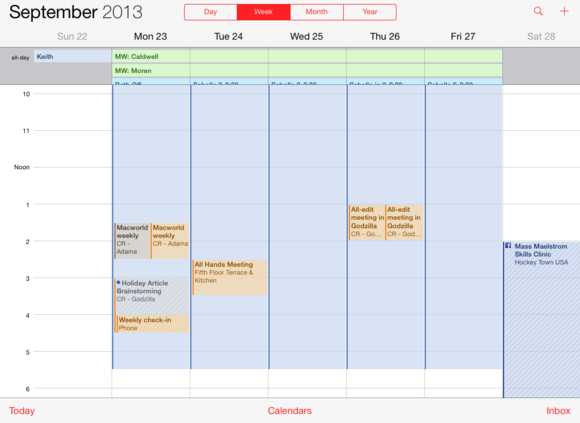 On an iPhone running iOS 7, Calendar takes on a more hierarchical organization. In day mode (which now sports a far more space-efficient view of the current week, with the current day clearly highlighted rather than the whole month), you’ll now see the current month shown in the top left, next to an arrow—tap that to go to a month view. In month view, the top left now shows the current year—tap again and you’ll get a look at the whole year. Calendar doesn’t try to cram events into either of those screens; such information is less than useful in such a confined space. In the month view, a dot below a date simply indicates whether there are any events on that day at all. To drill back down, just tap the month (from the year view) or the day (from the month view). The day and month views on the iPhone are far more useful than the merged view in iOS 6 and earlier. Calendar’s default day view on the iPhone is far more functional than its predecessor; it more strongly resembles the iPad or OS X versions of the app. You get a small section that shows your all-day events—it’s scrollable but not resizable—and an hour-by-hour breakdown of events, displayed as blocks that you can tap to view or edit. Those events also show you more information on the main screen, including locations if you’ve added them. To move to other days, tap the day you want to view at the top in the current week’s list, or swipe left or right on the day view. You can also scroll through weeks by swiping on the week section at the top. On the iPad, the interface is more similar to the iOS 6 iteration, with a toolbar of view modes that include Day, Week, Month, and Year. (If you want that full-week view on your iPhone, you still need to rotate it into landscape orientation.) However, it features the same options, just presented in different ways—search results and the event inspector, for example, show up as popovers. The day view also presents a side-by-side look at the day’s events, plus a detailed view of the currently selected event. Creating new events is more streamlined in iOS 7, now that the start and end time fields are available directly from the top level of the creation popover. Along the bottom of Calendar’s main interface are three buttons that let you quickly jump to the current day in whatever view you’re in, see a list of all your available calendars, and summon an inbox of any newly received event invitations—and in a first for iOS, you can see previous invitations to which you’ve already replied. That screen also lets you view an event or change your current response quickly and easily. In addition to letting you edit and display or hide your existing calendars, the Calendars screen also lets you opt to show events to which you’ve declined invitations. 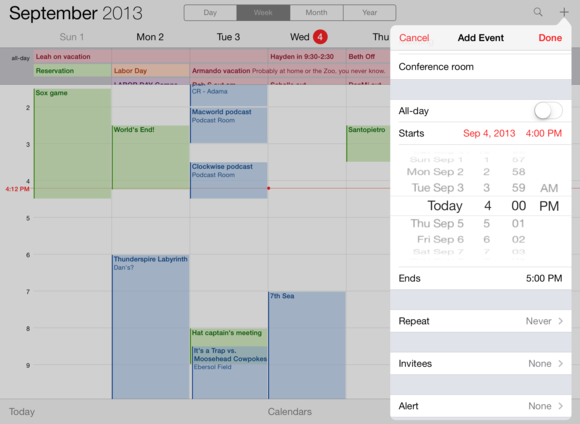 You create new events in iOS 7 pretty much as you did in iOS 6, but there are a few welcome refinements. The start time, end time, and all-day event options are now all accessible at the top level of event creation—as well as the Time Zone field, if you’ve enabled it in Settings > Mail, Contacts, Calendars—and you can edit them all independently. A new alert option notifies you a week before an event (handy if, for example, you need to get some shopping done before an occasion). A new URL field allows you to enter a link, and then tap it in the event details screen to open that webpage in Safari. Only two new options rear their heads in Settings > Mail, Contacts, Calendars. For one, you can now choose which day of the week the calendar starts on; by default, it’s Sunday. In addition, you can also choose the ‘1 week before’ setting as the default alert time for events. 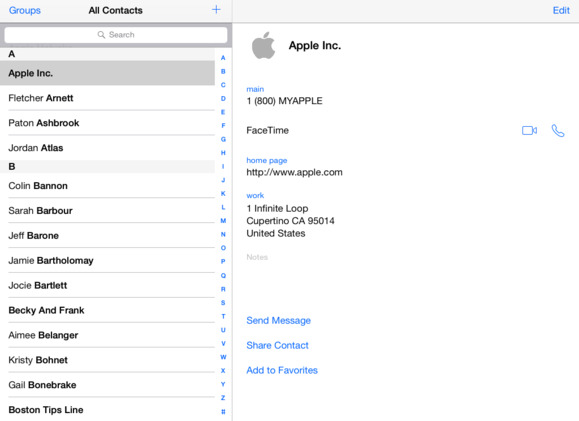 Check out the Contact app’s new icons and white interface in iOS 7. A circle rather than a square frame encloses your contact’s photo; sadly, you still can’t tap the photo to view it at a larger size. In addition, when you’re adding a new contact, the date (for an anniversary), related name (which allows you to add names for that contact’s spouses, managers, and other colleagues), social profiles, and instant message fields are now standard.